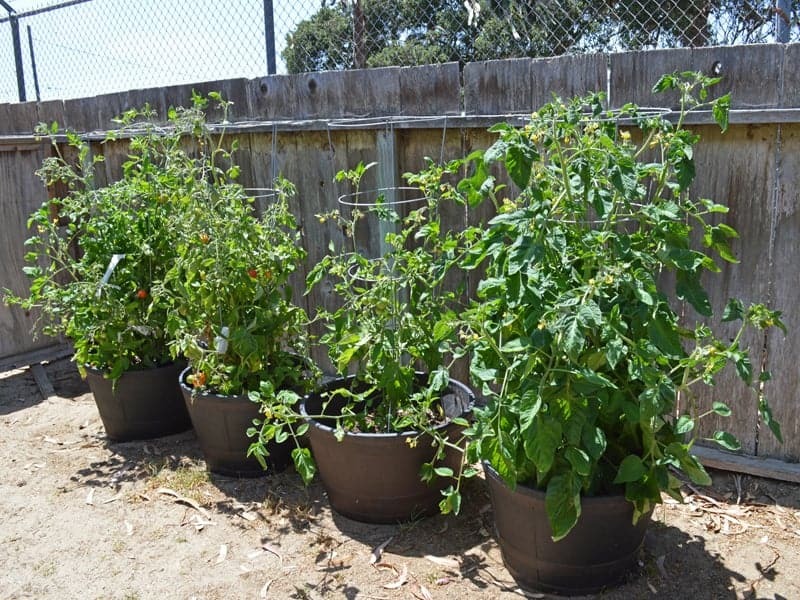 Growing tomatoes in pots is a great way to generate a crop in a small garden space. 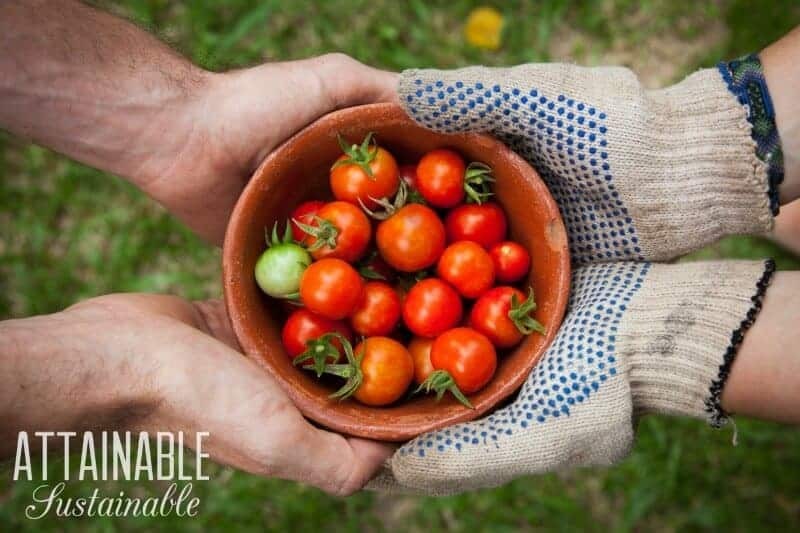 Here, the best way to plant tomatoes, the best soil for tomatoes, and how to maintain plants for success! You can plant any kind of tomato in a container. But if you’re planting tomatoes in pots or growing in a limited space, one might be a better option than another. To make that decision, you’ll need to understand is the difference between two types of tomato plants. Sometimes called vining tomatoes, indeterminate tomatoes will continue to grow and produce fruit all season long. It’s common for them to grow to six feet tall, but some will reach as much as ten or twelve feet. Without support, they will lean and fall every which way. Those little tomato cages you buy at the nursery are rarely strong enough to hold a tomato of this size upright. Indeterminate tomatoes bloom and set fruit throughout the summer. Yellow flowers, green fruit, and red fruit hang side by side on the plant until a killing frost puts an end to the season. These compact tomatoes, or bush tomatoes, top out at about three or four feet in height. Rather than producing fruit all season long, the harvest ripens within a shorter amount of time. 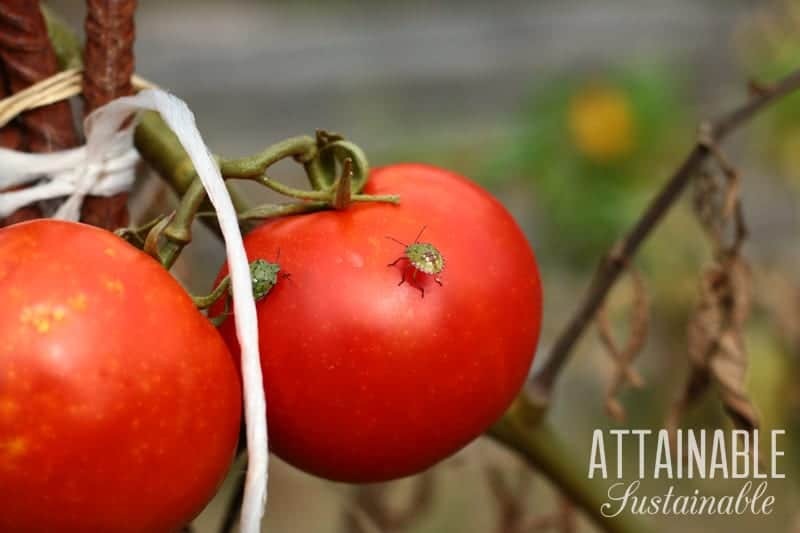 A productive determinate tomato plant will provide a lot of ripe tomatoes at once, so you’ll want to have a plan to use them up or preserve them. These bushy tomatoes need little support. And while it likely depends on the variety, in my experience, determinate tomatoes tend to be a better looking plant than their indeterminate cousins. All of these traits make them a great choice for a container garden. As discussed here, planting tomatoes in containers means choosing the right type of pot. Tomato plants have a deep root system and will appreciate a nice, large pot. Aim for one that’s at least 20 to 24″ deep, but larger pots will work as well. You can use utilitarian black plastic nursery pots (five-gallon size), pretty ceramic containers, or galvanized metal buckets. As long as the container is big enough, most anything can be upcycled for growing tomatoes in pots! A simple five-gallon bucket is an inexpensive alternative to other containers, though admittedly, they’re not as pretty. A half oak barrel is another good choice for growing tomatoes in pots. Be sure that any container you choose has good drainage. If you’re upcycling a bucket or other container, drill several 1/2-inch drainage holes in the bottom. 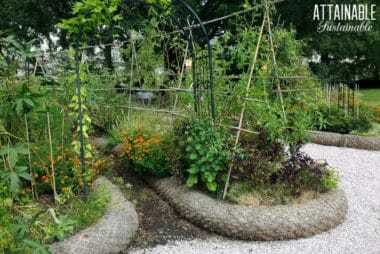 Go here for details on growing tomatoes in buckets upside down for an even more space saving vertical garden. I’ve had good luck growing tomatoes in grow bags like these. These grow bags are made of a porous, felt-like fabric that allows for air root pruning. Which is kind of a fancy way of saying that plants grown in these pots don’t get root bound like plants grown in hard-sided containers. Choose a good potting soil to start with. I like Fox Farm products, because they assure me that they do not use biosolids in their product. (Biosolids are recycled from sewage.) 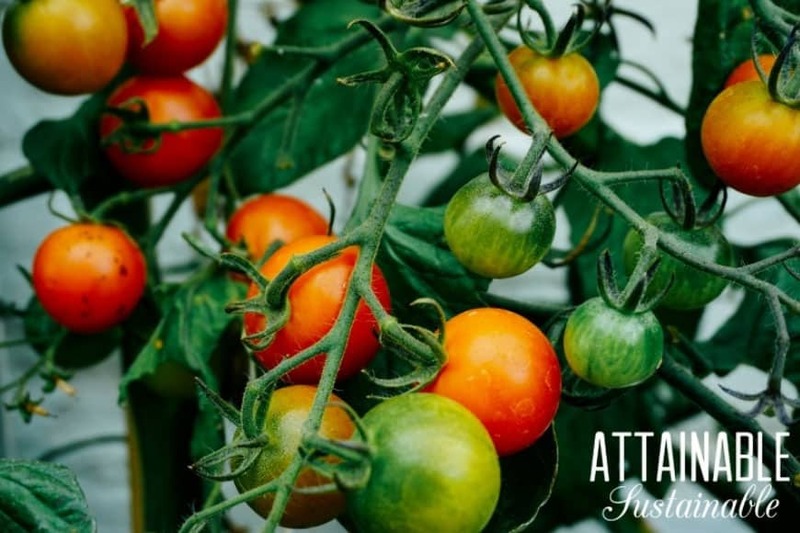 Since tomatoes like a lot of calcium, incorporate some ground limestone, gypsum, or crushed eggshells into the planter mix. A lack of calcium can cause blossom end rot. This part might go against everything you’ve learned about planting, but trust me. It will make your tomatoes stronger, even if you’re growing your tomatoes in pots. 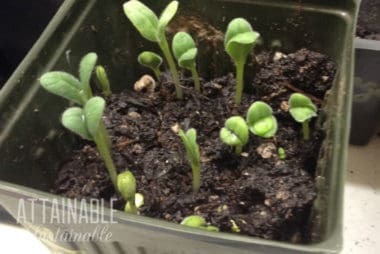 Fill your container about halfway with soil. Use a trowel to dig a hole large enough to fit the root ball of your tomato plant in the center of the pot. 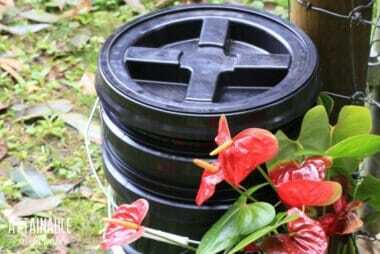 Remove the tomato plant from its nursery container and set it in the hole. Push soil around the root ball and water it in. YES. Planting tomatoes like this means that the plant is sitting well below the top of the container! Tomatoes send out roots from their stems when buried, so as the tomato plant grows, you’ll add more soil. Trim several leaves from the bottom of the stem and add more soil, several inches at a time. Roots will emerge under that new soil, giving the tomato plant more strength and more avenues to take up nutrients. 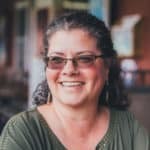 Water: Maintain the soil so that it’s moist but not too wet. To help retain moisture, add a layer of grass clippings on top of the soil. Growing tomatoes in grow bags? They soil might dry out a bit faster than in a solid container, so just keep that in mind. Fertilize: Every two weeks or so, water your plant with a tablespoon of fish emulsion mixed into a gallon of water. I also like to spray my tomatoes with a kelp spray. I mix a couple of tablespoons of kelp into a one-gallon sprayer and use it on my tomatoes (as well as other vegetables and fruit trees) every couple of weeks. Harvest: As tomatoes turn red (or yellow), harvest by gently pulling and twisting the tomato from the plant. So when you say you spray the tomatoes with the kelp solution are you spraying directly on the foliage? Or just on the base? On the foliage! I do it in the morning hours, though, so it has a chance to dry before nightfall.